Hey, did you guys catch that category on the mutiny on the Bounty? I hope you saw my post on it beforehand! Greg took a hit on that Daily Double in the first round, but made up for it toward the end of Double Jeopardy!. He’s got the lead, but he’s gonna need to nail Final to win, it looks like. This is a complicated one, so let’s get into it. If Chris doubles his score, he’ll have 29,600. To cover this all-in wager, Greg will need to wager 13,100. An incorrect response with that wager will leave Greg with 3,400. To stay above his total, Chris can wager up to 11,400. Amanda can wager up to 6,800. A successful doubling will put Amanda at 20,400. To cover this, Chris should wager at least 5,600. If Chris is incorrect with that wager, Amanda can wager up to 1,000 to stay above his total. 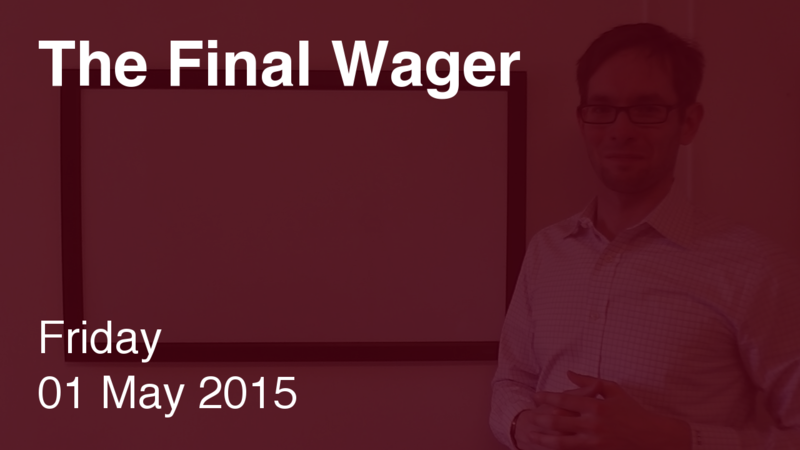 If Chris makes the rational maximum wager of 11,400, Greg will need to wager 9,700 to cover him. If he’s wrong with that wager, he’ll be left with 6,800. To stay above him, Chris can wager up to 8,000. Amanda may risk up to 3,400. Against Chris, Amanda can wager at most 1,000. With a correct response, she’ll have 11,200. To stay above this, Chris can wager at most 3,600. We’ll cap Greg at 5,300, too, just for fun. If he is correct, Chris will have 18,400. To account for this, Amanda will need to wager at least 8,200. Another day, another impressive total out of Greg – and he becomes the second player this season to win a full week of shows (after Alex Jacob). This just goes to show the importance of having the lead heading into Final.